Information about the History of Cobourg with photos, stories about key people and articles about architecture. Some articles are new and some have been collected from existing sources. Sources are given where possible and/or available but researchers may wish to follow up for themselves. Photos are included where available and links are provided to tie articles together. [ ] Square brackets indicate content not provided by author credited. New articles are added as they become available so come back again. Below is an overview of Cobourg's History but many more articles are available on this site. Settlers first started arriving in the area around Cobourg in the 1780's although they mostly went to the Quinte region in Prince Edward County south of Belleville. Most of the early arrivals were people who refused to join the American Revolution and were known as United Empire Loyalists (UEL). Their flag was the flag of England at the time - similar to the Union Jack but missing the Irish red diagonal cross which officially became part of the flag in 1801 (below right). However, these United Empire Loyalists who had come to the western wilderness of what was still part of Quebec were not satisfied with the limited rights and French laws established by the Quebec Act. So, in 1791, the British Parliament enacted the Constitutional Act, which split Quebec into two provinces - Upper and Lower Canada. Each of these was to be governed by a legislative council appointed for life (this has since become the Senate) and a legislative assembly elected by the people (now the House of Commons). Soon after, the Province's first Governor, John Graves Simcoe, established administrative districts and ordered that townships be surveyed and laid out between the Trent river (30 miles east of Cobourg) and the Humber river (just west of York, now Toronto). With this change, "Loyalist" settlers came to Cobourg in increasing numbers. 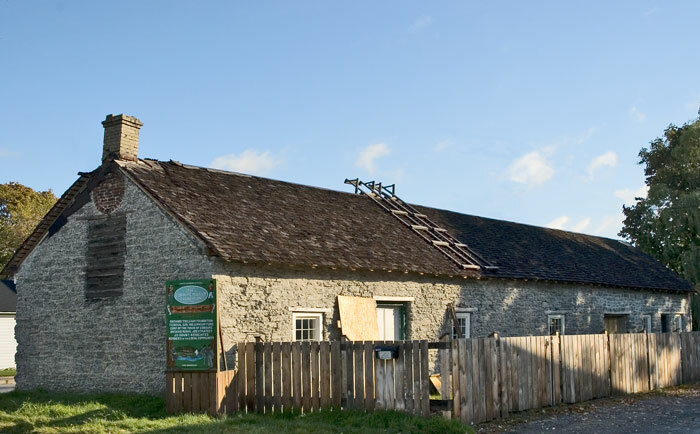 The consensus amongst historians seems to be that the first settler in Cobourg was Eliud Nickerson who built a cabin near King and Division Streets in 1798. [See The Poplars]. Eliud was a descendent of William Nickerson who emigrated from England in 1637 to settle in Chatham on Cape Cod. Eliud's father was Nathaniel and his mother Annice and he was born in 1760 at Danbury, Connecticut. He married Mary Margaret Fritz and arrived in Ontario via Belle Isle New Brunswick. 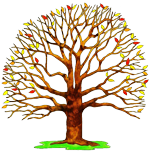 The settlement he founded was first called Buckville, after Elijah Buck, who settled there in 1808 and opened a tavern. Later, the settlement was named Amherst, after Baron Amherst. Even later, the settlement was called Hamilton, after the township. It was also nicknamed Hardscrabble. More. BarracksIn the early 1800's many more Loyalists arrived and although the term Loyalist was (and still is) used to describe those still loyal to the crown, it now included other groups such as disbanded British troops. In addition, there were frontier settlers from the American republic with no particular political orientation searching for better land. Many Cobourg residents participated in the war of 1812 (e.g. 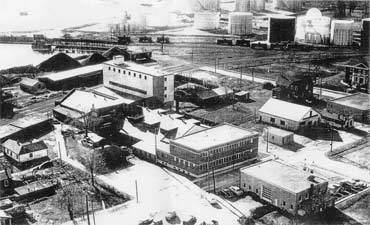 Ruttan) and one building in Cobourg - the Barracks - was thought to date from that time - although most do not agree. By 1827 there were about 40 houses, 2 inns, 4 stores, several distilleries, a grist mill and a population of 350. See the story of James Calcutt who arrived in 1832 for a better idea of this period. In 1829, parliament approved construction of a harbour at Cobourg to be built by a "Joint Stock Company". This started with the construction of two piers - one from the end of Division street and the other started just west of Third street. Ships could dock there starting in 1832. On July 1st, 1837. 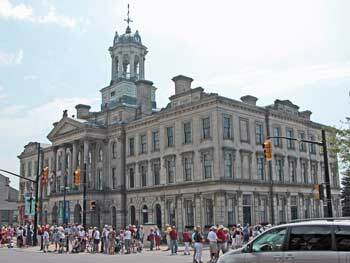 Cobourg was officially incorporated as a town - making July 1st of double significance to Cobourg. This was 10 days after Queen Victoria became monarch but 33 days before the news reached Cobourg! Starting in 1832, there was massive immigration from the U.K. and the area rapidly developed into a thriving centre of administration, education and commerce with a population by mid-century of nearly 5,000. By 1850, ambitious civic leaders were entertaining thoughts that Cobourg, if its flourishing harbour were linked by a railway to the markets in Peterborough, might overtake the larger centres of Toronto and Kingston in size and influence. Unfortunately, Peterborough was on the other side of Rice Lake and going around it would mean conceding that Port Hope would be a closer harbour. This seems to be an early example of Port Hope/Cobourg rivalry. It was during this period that Victoria Hall was built and opened by Prince of Wales, Albert, who later became King Edward VII. However, by the 1860's, the failure of the Cobourg & Peterborough Railway, municipal debt from the construction of Victoria Hall, and a province-wide economic depression, had put a stop to these dreams. Ferry 2 For most of the next century, the population remained stable, although its brief heyday as a turn of the century American summer resort brought Cobourg a certain social cachet and style. The results of this "American Connection" can be felt today with the many grand homes built during this period still to be seen today. See also a view of Cobourg in 1878 and Homes with a History. During this period, commerce relied heavily on rail and water transport so part of the grand plan for Cobourg included designing and building a harbour on Lake Ontario (it started as just a wharf). Not only did coal and iron ore go through this port, but also considerable passenger traffic via the Rochester Ferry (photo above) which was owned and operated by George S. Daintry. There were sometimes 2 trips a day for each ferry and they operated throughout the year. Waterfront 1956 - Click Photo to enlarge.From about 1950 to the early 1980's, Cobourg harbour saw large shipments of coal and oil with railcars loading directly into ships in the harbour. The photo at right (1956) shows the harbour looking South West across Albert Street. Note the piles of Coal and Oil tanks. The "Old Jail" (far right, near top) is one of the few buildings remaining. More on the story of the harbour here. During the 19th century, there were many entrepreneurs, government officials and others who made a name for themselves. The stories of some of them are told on this site (e.g. Weller, Crossen, Cockburn, Calcutt, Ruttan and others). In the early 20th century, Cobourg participated in the movie industry by being the birthplace of Film Star Marie Dressler as well as having several movie houses. However, there was little change in population until the middle of the 20th century when social change and economic expansion after World War II resulted in the Town of Cobourg more than tripling its population to over 18,000 residents.